BEST friends Rikki-Lee Sharpley and Nellie Ah-See, both aged seven, are polishing off their second breakfast of the morning: Vegemite toast for Rikki-Lee and tinned spaghetti on toast for Nellie. 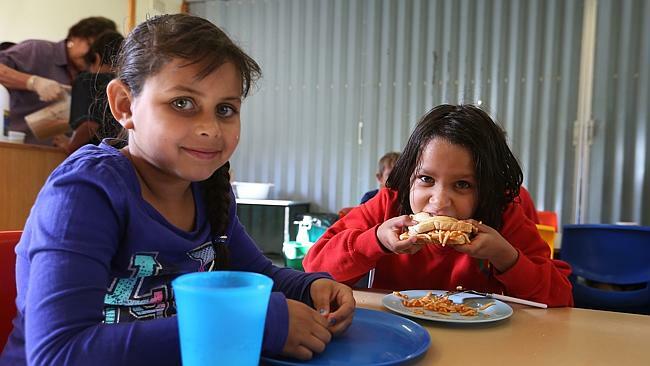 They ate at home but often come for a second helping at the breakfast club run every morning at their school in Walgett in far northwestern NSW. But it's not just the food they like. When asked why they like coming to school, with explosive grins Rikki-Lee and Nellie shout: "To get smart!" The answer is a world away from the attitude that greeted Adrian Piccoli on a visit to Walgett Community College a year ago. When the NSW Education Minister asked Year 6 students how many intended to finish Year 12, only half the class raised their hands. One year is a long time for a child, and long enough for a school to start to change a child's life. Walgett is one of 15 remote schools in NSW that are part of the government's Connected Communities program, which was unrolled at the beginning of last year. The schools, of mostly Aboriginal students, have languished at the bottom for decades; ignored and neglected in their physical condition and the standard of education provided. The neglect was not just by the education system and government; in parliament last year Piccoli said the broader community had to shoulder some of the blame in its acceptance of a double standard for these students. "We as a community have treated Aboriginal people like rubbish, particularly those in some remote communities where they are hidden from view," he said. The Connected Communities program is intended to change that. Under the program, highly experienced, highly paid executive principals have been appointed to partner with the community and other government agencies to lift performance in the schools by throwing out the rule book. The principals have the freedom to choose their own staff, including moving out teachers, the flexibility to decide how to spend their budgets - and the minister's eye. One year after his furious outburst in parliament, Piccoli is on one of his regular trips through outback NSW, touring six of the Connected Communities schools, and the early signs of change are apparent in physical changes, the feel or culture under different leadership and staff. "My objective is to get the schools operating at 100 per cent; that involves the right principal, the right teachers, the right facilities and the right resources," he says. "It doesn't mean the community is operating at 100 per cent. We can change the school but changing the school is also changing the community. We're starting to see some of that trickle effect. "By lifting the school, the literacy rates change, it's starting to change attitudes in the community about the importance of school, more parents are sending their kids to school, they have more confidence in the school." As word gets out, some of the schools are reporting a growth in enrolment after years of falling student numbers. Every school is adopting its own approach to building a relationship with the community, which Piccoli says is the beauty of the Connected Communities program: "We have 15 different communities doing 15 different things, all based on their own needs." The physical conditions are the easiest to improve, requiring only the will and the money. As part of a $35 million capital works program, the schools at Walgett and Moree East already look better with a coat of paint and, along with Brewarrina Central School, have fin­alised plans to rebuild. But even the money is not always enough. For years, student attendance at Walgett has been ­affected by the poor condition of the roads to the Aboriginal communities at Namoi and Gingie, the old mission towns. When it rained, the school bus was unable to drive down the dirt roads, and in summer, when temperatures often pass 40C, students had no shelter. Roads inside the community are the responsibility of the land council, which didn't have the money, so Piccoli became the first education minister to build a road. Two roads in fact. As a Nationals MP and a born-and-bred country boy, Piccoli is familiar with the frustration of rural communities that their needs are overlooked by city folk, but equally frustrated by the desensitisation that occurs in communities that get used to doing without. "What really struck me was the man from the mission who said it was the greatest day in Namoi mission ever and he only wished his mother, father and grandparents were alive to see it," he says. "What's sad about that is all we've done is build a road in the same condition as the road in front of my house. We haven't built a school, a hospital or a swimming pool, we just tarred a road. "That to me is the real shame of what I raised a year ago. It's not the tar and concrete, it's the message you send. When a school looks like Walgett High or Moree East, what does it say to the communities about the value we place on Aboriginal communities, and on educating them? It's the sort of thing non-Aboriginal communities absolutely take for granted and would never accept in one minute, but some Aboriginal communities have become desensitised to it and accept a lower standard of service." The challenge is improving the education of the students and, although this is a longer-term proposition than rebuilding a school, there are promising early signs. The arrival of a motivated team of experienced school leaders is changing a culture that accepted poor results as par for the course. When this year's prep students started in the 15 Connected Communities schools, only 13 per cent met expectations for their age in literacy and 22 per cent in num­eracy. By September, almost three-quarters were meeting expec­tations in literacy and 85 per cent in numeracy. The achievement is all the more remarkable considering most of these children start school with no early literacy skills; they have no experience of printed material, have never seen a book or been read a story, do not know any of the alphabet or how to hold a pencil. The schools can tell you exactly how much progress students have made with reference to their "data wall", a proud feature in staff­rooms. Every student's name is placed along a continuum of literacy and numeracy skills, with regular tests tracking improvement. At Toomelah, an Aboriginal community with a troubled history that has a small school with only 30 students, all the children who started school this year are expected to reach the literacy standard by the end of the year. At Coonamble Public, a third of the 24 prep students already have reached the standard, twice the proportion of last year; while the prep class at Walgett was one of the top three most improved schools in the state last term, with almost all its students expected to reach the standard by the end of the year. Those who won't are new arrivals to the school; the class has grown from 12 students at the beginning of the year to 21, with some moving over from the local Catholic school and others moving back to town with their families. Teachers at Walgett say the difference is not just in the reading and writing skills but also in the children's social development, which is "staggering". "They're confident in themselves, they like being in the class, while last year's kindergarten class was a bit downtrodden and generally not happy or pleased to be here," one teacher says. At Coonamble Primary, executive principal Brian Giles-Browne, or Mr GB as the kindergarten class calls him, attributes the success of his students to a strong preschool program, which it is planning to extend to three-year-olds; team-teaching, which places two teachers in the classroom; and the instructional leader model, which is a feature in all the schools and essentially provides a teacher for the teachers. "People are now really focused on the individual and assessing the individual very regularly. It's about knowing the kids' background, knowing what level they're at and knowing the best possible teaching method," he says. Giles-Browne was lured back to Coonamble after serving as principal 20 years ago by the prospect to put into practice some of the ideas he had been developing at Principals Australia Institute. He says the project is the first to focus on building a connection with the community, and then build educational programs on top of that relationship. At Moree East Public, executive principal Muriel Kelly, who is in her second year at the school, has rebuilt the bridge between the school and its community. In Moree, the differing standard for Aboriginal and non-­Aboriginal students is stark. At Moree Public in the town's west, where most students are non-­Aboriginal, the school's grounds and facilities are pristine. Across the river at Moree East, which is the traditional mission school, 85 per cent of students are Aboriginal and the school resembles one from the Third World. Classrooms have only one power point, no airconditioning, the floors slant and live electrical wires are strung from roof to roof. The community has felt let down by the school for many years, and Kelly, who commutes every week from her home in Ballina on the coast, has worked hard with local elders to spread the word of the changes. "It's starting to change, we're getting more parents coming to us," she says. "What we're trying to do is take at least one person, get them to feel comfortable and confident so they can go back to the community and talk about having to work together." Part of the strategy has been to involve local elders, through the community advisory group and also in teaching traditional culture, dance and Dreamtime stories to students. At the end of the year, the school will host the important local Brolga Festival. For Kelly, an Aboriginal woman who was let down by the education system, it is a very personal crusade. Being Aboriginal gives her an insider's understanding of the cultural issues and community hurt, but Kelly says it also shows her students "you can achieve your dreams". "I was never taught. I had teachers who disregarded me and taught the other side of the classroom. That's why I'm a teacher; I don't want it to happen to children any more," she says. For Piccoli, the goal is to "chop off the end of the tail" of under­achievement in rural schools, and among Aboriginal students, and to "people-proof" the changes, so the schools continue to thrive and improve under future education ministers or different principals and teachers. "The real challenge is keeping the kids in kinder this year at least above the minimum standard, and the kids who follow them, all the way to Year 12. If we can do that, then we can say we've succeeded," he says.